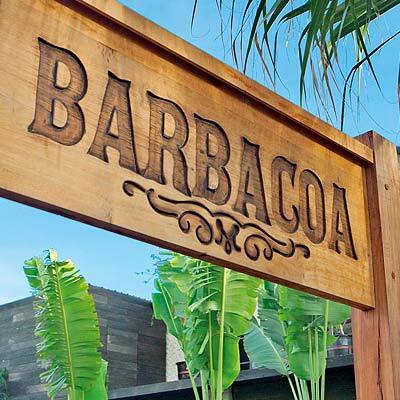 If you’re a regular Petitenget prowler, you won’t have overlooked this restaurant, which goes by the name of Barbacoa. Sure, we’ve heard of many rustic restaurants in Bali these last two years. But this one is in a league of its own. Unlike the usual feminine chic-rustic designs I’ve come across, Barbacoa has a more robust vibe to it with the significant use of elements like wood, red bricks, cow skin hanging on the wall, and an outstanding open-fire grill. And then there are the darling points, like the Mediterranean patterned tiles, the Acapulco chairs, and the priceless backyard rice field. Heavily inspired by food from South American countries like Argentina, Peru and Mexico, all the recipes here are built from scratch. The food menu is only a page long, but each of the dishes packs a refreshing punch. The best way to enjoy Barbacoa’s finest is to order as many dishes as you can and share them with friends. Go back-to-back snapper with a fresh take on a Mexican favourite – battered snapper taco with mango (Rp.75,000), and Peruvian style snapper ceviche with kicking bites of orange chilli, black pepper, red onion pickle, and of course coriander (Rp.95,000). The charcoal octopus with crispy polenta and chorizo (Rp.95,000) and Spanish potatoes with garlic aioli (Rp.60,000) are sublimely rich in flavour. If like me you can’t pass a grill without having your carnivore instincts roused, don’t miss the Asado – that’s barbeque – of the day, with the option of either Australian lamb or pork (Rp.190,000). I tried the lamb, and it was simple yet gloriously buttery in taste. Sweeten the experience with the rice pudding (Rp.50,000), adorned with dates and almonds, and vanilla bean and white wine sauce. Barbacoa takes pride in its tequila selections – from Jose Cuervo to Patron. But if you’re more into wine or rum (they have Ron Zacapa here), or cocktails, they still cater to your needs. Try the jalapeno margarita (Rp.95,000) to jumpstart the night. With its high ceilings, spacious interior, and its gleaming bar, Barbacoa feels grand and classy. Yet it doesn’t have that hoity-toity feel that we all like to avoid. Romance it up on the leather couch seating, have a boys (or girls) night out at the bar, kick back and relax over snacks on the patio, or up the intimacy a notch with a fruit shisha in the lounge and bar upstairs. This place just has all the right vibes. Ask chef Adam if he can make you some ice cream with the liquid nitrogen thingamajig. Pure magic.